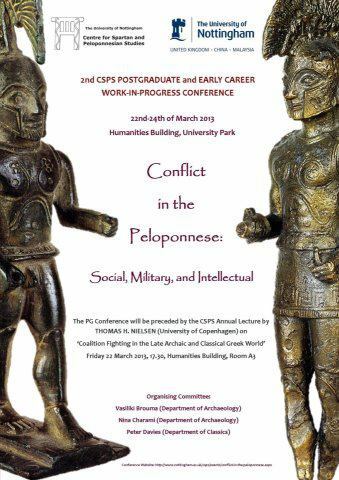 Conflict in the Peloponnese, Social, Military and Intellectual, 2nd CSPS Post Graduate and Early Career Work in Progress Conference. From Pre-history to modernity the Peloponnese has been the setting for many conflicts. This conference will allow young researchers working on the social, military and intellectual conflicts which have defined the formation of the identity of this region to share their on-going research. The Centre is pleased to present papers from post graduates and early career researchers working in all disciplines of the Arts, Humanities and Social Sciences: particularly those working on the archaeology, history and literature of the Peloponnese. The official language of the conference will be English.There will be no attendance fee for this conference. For info contact Peter Davies.